Dupin's celiac disease diagnosis four years ago changed her career - and her life - for the better. “I’ve loved food my whole life, and I was thrilled to be working as a chef, but I felt exhausted all the time and I was severely anemic,” says Dupin, who has worked for comedian Jerry Seinfeld and New York Yankees first baseman Mark Teixeira. “When the doctor told me I had celiac disease, I was simultaneously relieved to finally have a diagnosis and terrified that I would have to give up everything I loved. But with a little extra attention to ingredients, I’ve developed ways to eat great without gluten." Gluten-Free Entertaining contains more than 100 recipes, arranged by occasion but also appropriate for everyday. Rather than using more expensive gluten substitutes, Dupin focuses on nutritionally sound whole foods that are naturally gluten free. Recipes in the cookbook include appetizers like cornbread bites with andouille sausage and braised bacon nachos with chipotle-peach chutney, entrees such as baked salmon with roasted tomatoes and fennel, and desserts like cinnamon churros with chocolate sauce. 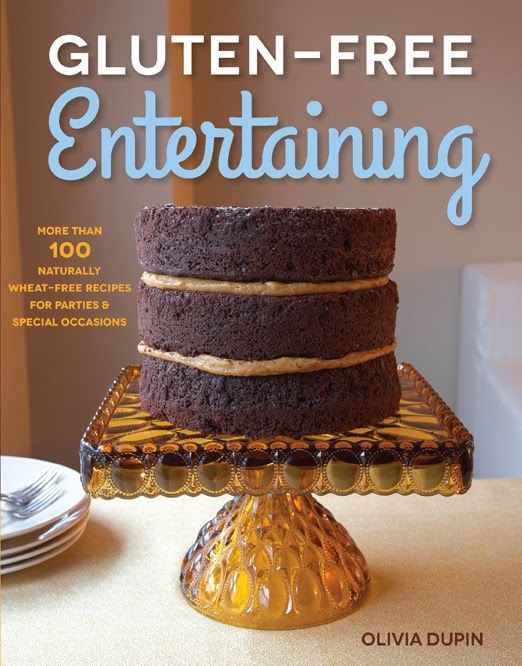 Two Gluten Free Philly readers can win a copy of Dupin's new Gluten-Free Entertaining cookbook. To enter up to three different ways, follow the instructions below. Entries are being accepted through Sunday, December 8. Good luck! I'd love to win this book! I make special cakes for the GF Hubby for every gathering we go to....Especially Chocolate Cake with Peanutbutter Icing!! I would love to win this book! Very much in need of some new entertaining recipes! I'm newly diagnosed with gluten intolerance. So far my entertaining menu has been pretty bland. Recently made turkey, roasted brussel sprouts and quinoa with sage butter. Haven't tackled desserts yet! I love sweets! With the holiday season, my favorite thing to make is a tray of chocolate covered GF goodies! It never lasts long and everyone can enjoy it! I have one awesone gf cookbook (La Tartine Gourmande) and I can't wait to add to the collection! The cake on the cover looks awesome. I find that Guacamole makes the world go round. I use Rick Bayless' guac mix- a packet of liquid goodness added to 2 avocados makes a terrific guac for GFers and wheat-eaters alike. I just found a simple cheese cake receipe that is a crowd pleaser! As basic as it sounds, I have people beg me to make these for parties. I give platters as gifts. Chex Treats! Instead of Rice Krispies, I use Chex! Delicious! Add some peanut butter, some chocolate chips, whatever to make them different each time! We like to make dal tadka (an indian spiced lentil dish) that works great on a buffet or for dinner for two. I have found a recipe for Gluten Free Blueberry Scones and they are just amazing! We drink tea every day and these scones are a great little treat to have with the tea. I have also taken them to a recent shower I was co-hosting and they went over fabulously there!